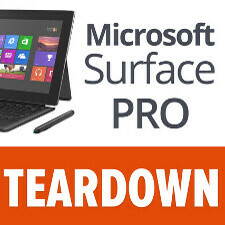 The Microsoft Surface Pro is finally here and it is the real deal, coming with a full-on Windows 8 supporting legacy apps, but there are a few important compromises that it comes with. As a tablet it has an unimpressive battery life, and as a laptop it can’t quite stand well in your lap. If you can deal with these two, it seems to pay back with ultrabook-like performance. And now we get to look inside the Surface Pro where there is the Intel Core processor and two fans keeping it cold. It’s hard to open it up, the device is all glued tightly and you’d need a heat gun and a craftsmanship degree to separate the display. Luckily, device surgeons from iFixit managed to disassemble it after a lot of prying. As a result you get to see all the device’s internals. Also, the goal of this whole exercise is figuring out how hard or easy it is to repair the device. Turns out, there are some bad news. The Surface Pro is a terrible device to repair. With a whopping 90 screws holding it together, an extremely clunky display assembly and a lot of adhesive, it’s extremely hard to disassemble and repair the Pro. The device scored an abysmal 1 out of 10 for repairability, worse than the 9.7-inch iPad which by now held the lowest scores. Really cuz you can repair any other tablet.. including ipads easily. just compare it to samsung galaxy note 10.1 in this question and you will get the idea who is thinking of consumers. that s**t is not even worth mentioning. The interface is tedious, completely opposite to the phone. Android gets ugly on 10-in tablet screen while 7-in is fine. only two to consider are nexus 7 and kindle fire. Galaxy note is a real tablet which is very powerful and productive. A clue word is a tablet. Surface is a compromise between a netbook and a tablet. Besides the sammy's tablet was ranked as high as 8.5 by ifixit. It's possible to replace a lot of components by yourself in the that tablet. 90 screws in the pro? This is a nonsense. MS has re-invented the concept of throw-away - if the Surface breaks, you throw it away. Lets see, now... How long is the warranty? deny its below average battery life. ms just got micro srcewed. at the very first place it is screwed by 90 screws and the next it screws you like no other before.